To Cite: Fakhar N, Nikeghbalian S, Kazemi K, Shamsayeefar A R, Gholami S, et al. Transplantation of Deceased Donor Livers With Elevated Levels of Serum Transaminases at Shiraz Transplant Center, Hepat Mon. 2016 ; 16(10):e40140. doi: 10.5812/hepatmon.40140. Background: The current organ shortage has prompted the use of marginal organs. We conducted this retrospective study to present our experience with transplanting deceased donor livers with elevated levels of serum transaminases and to explain whether elevated levels of serum transaminases in donors affect allograft function and survival of the recipients. Methods: Data of deceased donor livers and patients, who underwent liver transplantation from March 2013 to March 2015 at Shiraz center for organ transplantation, was reviewed. Liver donors with aspartate aminotransferase (AST) and/or alanine aminotransferase (ALT) level of more than 500 IU/l and their related recipients were considered as the case group (n = 24) and the others were considered as the control group (n = 834). Results: In the case group, the medians of levels of serum AST and ALT of donors were 834 ± 425 IU/L (range: 250 - 2285) and 507 ± 367 IU/L (range: 100 - 1600), respectively. Recipients were followed for a median of 13.6 ± 9 months (range: 7 - 28.4). Post-transplant complications were acute rejection (n = 5), infection (n = 3), portal vein thrombosis (n = 3), bile duct stricture (n = 1), and hepatic artery stenosis (n = 1). The one-year survival rate of the patients was 91.7%. Demographics, post-transplant complications and one-year survival rates were not significantly different between the two study groups. Conclusions: Transplanting deceased donor livers with markedly elevated liver enzymes may be an acceptable choice for expanding the donor pool. The number of liver donors has not kept pace with the growing need for liver transplantation and the current supply does not compensate the need for liver grafts (1, 2). To overcome the discrepancy between supply and demand in liver transplantation, utilization of marginal or extended criteria liver grafts has been proposed as a solution for increasing the liver donor pool, which has been accepted by an increasing number of transplant centers (3, 4). Marginal or extended criteria donors are defined as those with a greater risk of initial poor function or graft failure and therefore an increased risk for recipient morbidity and mortality. Currently, some extended-criteria are elderly donors, steatotic liver grafts and hepatitis B core antibody-positive donors. However, there is no consensus about the definition of extended criteria liver grafts and it varies among liver transplant centers (5, 6). Widening the extended criteria, such as using deceased donor livers with elevated levels of serum transaminases is a reasonable solution for expanding the donor pool. Elevated levels of serum transaminases in donors signify injury to hepatocytes, thus many transplant experts discard livers with markedly elevated levels of serum transaminases for transplantation (1, 7, 8). In spite of this, it is not clear whether high levels of serum transaminases in the donor will affect the allograft function, and there is no clear upper limit in serum transaminases that contraindicates use in transplantation (5). There are few limited studies, which studied the effect of elevated levels of serum transaminases in donors on the allograft function in recipients (6, 8-10). Our aim was to present our experience with transplanting deceased donor livers with elevated levels of serum transaminases and to find whether the elevated levels of serum transaminases in donors affect allograft function and survival of the recipients. After obtaining consent from the ethics committee of the center, the data of our patients, who underwent liver transplantation from March 2013 to March 2015 were reviewed. Recipients, who received liver grafts from donors with aspartate aminotransferase (AST) and/or alanine aminotransferase (ALT) serum levels of more than 500 international unit/liter (IU/L) were considered as the case group and the others were considered as the control group. Data including demographics of donors and recipients, model for end stage liver disease (MELD) score, early post-transplant levels of serum transaminases, biliary and vascular complications, infection, length of hospital stay, rejection, and survival rates of recipients were retrospectively reviewed. The appearance of all donor livers were evaluated by the same transplant surgeon before the surgery and the frozen sections of specimens obtained by a true-cut needle biopsy were examined by the same transplant pathologist. All procurement surgeries were carried out by the same team of transplant surgeons and fellows with acceptable experience in transplant surgery. The technique included double flushing of the aorta and portal vein with University of Wisconsin solution, followed by flushing the portal vein in the organ bag after retrieval with University of Wisconsin solution and standard duct flushing. The liver graft was maintained in a standard ice-box. All transplant surgeries were carried out using modified piggy-back technique and cavocaval side-to-side anastomosis without temporary portocaval shunt or venovenous bypass. Portal vein and hepatic artery anastomoses were performed with running suture. In most patients, the common bile duct was reconstructed with an end-to-end anastomosis. Immunosuppression was induced with methylprednisolone (1000 mg) during the anhepatic stage. The maintenance immunosuppression protocol for most patients included a three-drug regimen including a corticosteroid, calcineurin inhibitor and mycophenolate mofetil. Data analyses were performed with the SPSS statistical software (IBM SPSS Statistics for Windows, Version 20.0, IBM Corp., Armonk, NY, USA). Quantitative and qualitative data were analyzed using the independent t-test the Fisher exact test, respectively. Nonparametric data were analyzed with Kruskal-Wallis test. Patient survival rates were calculated using Kaplan-Meier method. Statistical significance was defined by P ≤ 0.05. During the study period, 858 deceased donor liver transplantations were performed at our center. Patients, who received livers from deceased donors with serum transaminase levels of more than 500 IU/L were considered as the case group (n = 24) and the others were considered as the control group (n = 834). In four donors of the case group, the levels of serum AST were more than 1000 IU and in two, the levels of serum ALT were more than 1000 IU/L. The medians of levels of serum AST and ALT of donors in the case group were 834 ± 425 IU/L (range: 250 - 2285) and 507 ± 367 IU/L (range: 100 - 1600), respectively. In the case group, inotropes were administered in 20 donors; at least one episode of cardiopulmonary cerebral resuscitation was done in five donors and the median length of hospital stay of deceased donors at the intensive care unit was two days (range: 1 - 12). As shown in Table 1, there was no significant difference between demographics of deceased donors and recipients in the two groups. The main etiologies of liver failure in recipients were cryptogenic cirrhosis (20%), auto-immune hepatitis (16%), viral hepatitis (16%), primary sclerosing cholangitis (13%) and metabolic disorders (8%). Similarly, the main etiologies of liver failure in the control group were auto immune (20%), viral hepatitis (19%), cholestatic cirrhosis (19%) and metabolic disorders (16%). Abbreviations: CVA, cerebrovascular accident; MELD, model for end stages disease. aData are shown as medians ± standard deviations (range) or %. Recipients were followed for a median of 13.6 ± 9 months (range: 7 - 28.4). 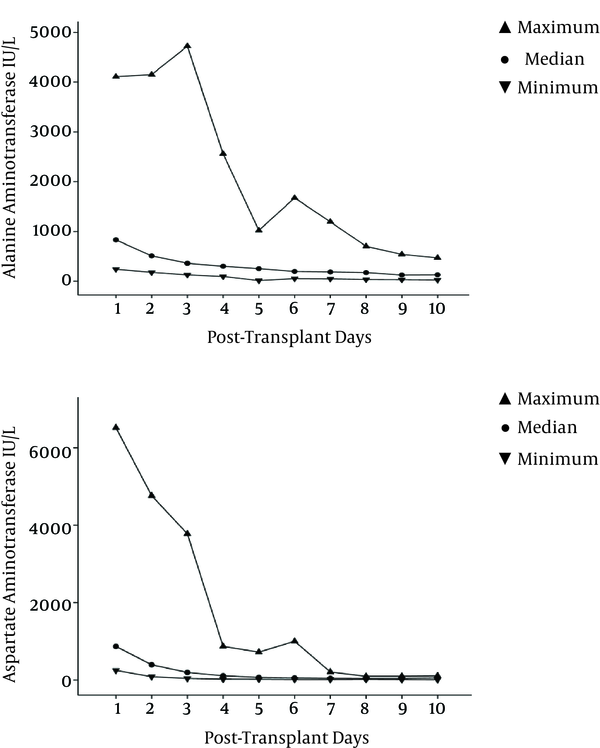 The trend of early post-transplant changes of AST and ALT, during the first 10 days after transplant, is shown in Figure 1. During the study period, in the case group, five recipients experienced episodes of acute rejection and all were successfully treated with the administration of methylprednisolone pulse. Three recipients experienced portal vein thrombosis. The first one developed portal vein thrombosis followed by liver necrosis and multiple-organ failure and died at eight days post-transplantation. The second one developed portal vein thrombosis at one day post-transplantation, most probably caused by overcorrection of coagulopathy and was successfully treated with surgical thrombectomy. This patient experienced bile duct stricture at 22 days post-transplantation, and was successfully treated with percutaneous transhepatic biliary dilatation. The third one was a patient with Budd-Chiari syndrome’s related cirrhosis, who underwent portal thromboendovenectomy during the transplant surgery and developed portal vein thrombosis at three days post-transplantation and was successfully treated with surgical thrombectomy. This patient also developed hepatic artery stenosis at 20 days post-transplant and was successfully treated with percutaneous angioplasty. The significant post-transplant infections included pneumonia in two patients and urinary tract infection in one with good response to medical management. The data of post-transplant complications are shown in Table 2. The one-year survival rate of the recipients in the case group was 91.7%, which was not significantly different from that of the recipients in the control group with survival rate of 89%. In the case group, two recipients died during the study period. One was a 58-year-old female with a past medical history of chronic obstructive pulmonary disease and type two diabetes mellitus with model for end stages disease (MELD) score of 40. Her liver function was normal after liver transplantation, although she died because of pneumonia and sepsis at 35 days post-transplant. The second patient was male, who developed portal vein thrombosis and liver necrosis just after transplant. He received retransplantation three days after the first transplantation, but developed sepsis, multiple-organ failure and died eight days after retransplantation. The detailed data of the deceased donors and their related recipients in the case group is shown in Table 3. Abbreviations: ALT, alanine aminotransferase; AST, aspartate aminotransferase; BDS, bile duct stricture; CIT, cold ischemic time; F, female; M, male, HAS, hepatic artery stenosis; IU/L, international unit/liter; MELD, model for end stages disease; PVT, portal vein thrombosis; UTI, urinary tract infection. Organ shortage is a major challenge for the transplant community, which results in about 7000 deaths in the waiting list of liver transplantation in one year in the US (11). Thus, developing strategies to expand the pool of organ donors is a high priority. One of these strategies is using extended criteria donors, however the definition of extended donor has not been thoroughly established and varies among liver transplant centers. In our study, 24 out of 858 (3%) patients received liver grafts with levels of serum AST and/or ALT of more than 500 IU/L. Unfortunately, the data of liver function tests and the cause of elevation of levels of serum transaminases in our deceased donors were not available. The decisions of using these grafts were made by the surgeon due to organ shortage at our center, critical conditions of the recipients, and the overall conditions of the donors and the grafts. The one-year survival rate and the rates of post-transplant vascular, biliary and infectious complications in the case group were comparable to that of the control group and the data of recipients, who received liver grafts with normal levels of serum transaminases in the literature (12, 13). Denoting that the levels of serum AST and/or ALT of deceased liver donors of more than 500 IU/L may not adversely affect the final outcome and survival of the recipients. Two recipients died during our study, one from pneumonia, sepsis and multiple organ failure and the other was due to liver necrosis secondary to portal vein thrombosis. It is important to mention that post-operative complications including portal vein thrombosis, hepatic artery and bile duct stenosis could be directly the result of the poor quality of the graft, however, their rates were comparable with the control group. Unfortunately, paucity of data about the cause of elevation of the levels of serum transaminases in donors in the case group, which may have affected the decision of using the grafts, was the major limitation of our study. However, trauma, as the main cause of death in our donors, may justify the elevation of levels of serum transaminases. Aspartate aminotransferase is in the cytosol and mitochondria of hepatocytes, heart, skeletal muscles, kidney and brain, and ALT is only found in the cytosol of hepatocytes. When hepatocyte injury or necrosis, such as hepatitis, trauma, liver shock and cardiopulmonary cerebral resuscitation, occur, the transaminase level, especially AST, increases in the serum. Elevated levels of serum transaminases can signify hepatocyte injury and necrosis. However, this does not necessarily signify poor organ quality. Moreover, the liver may have regenerative capacity and, if it is healthy in structure, it could tolerate significant loss of hepatocytes. Thus, it is difficult for a transplant surgeon to decide to use or discard an organ from a donor with elevated levels of serum transaminases (14-16). Most studies do not include serum levels of transaminases in the extended donor criteria. These studies enumerate age, graft steatosis, type of donor, cold and warm ischemic times, length of stay at intensive care unit, body mass index, serum level of sodium, and positive viral markers as extended donor criteria (9, 17-21). However, some studies enumerate serum levels of transaminases as a prognostic factor of the outcome of liver transplantation. Bacchella et al. in 2008 suggested a scoring system to denote the liver graft quality including serum levels of transaminases in donors. In their study, liver grafts from donors with AST and/or ALT levels of more than 600 IU/L were routinely discarded (8). Moreover, studies on machine perfusion during the ex vivo phase of preservation, has shown that the level of transaminase in perfusate fluid may predict primary non-function and graft failure (22). In contrast, in a consensus meeting in 2008, it was proposed that there is no clear upper limit in serum transaminases that contraindicates use in transplantation. Liver procurement should not be excluded on the basis of liver function tests (5). Mangus et al. in 2012 studied 89 out of 1348 (7%) patients, who received grafts from donors with moderate to high levels of ALT over a 10-year period. Similar to our study, ALT of more than 500 IU/L was considered as moderate elevation, and ALT of more than 1000 IU/L was considered as severe elevation. Their results showed no significant difference in early graft function and one-year graft and patient survival rates among patients with variable levels of serum ALT (10). Radunz et al. also presented that transplantation of livers of eight donors with medians of AST and ALT of 1400 IU/L (range: 500 - 7538) and 1026 IU/L (range: 308 - 9179), respectively, did not adversely affect the outcome and survival rates of the patients (6). In conclusion, transplanting deceased donor livers with markedly elevated liver enzymes may be an acceptable choice for expanding the donor pool, however more powerful studies with a larger number of patients are required in the future.